French 3 and 4 Curriculum Bundle: Ça y est, je parle français! 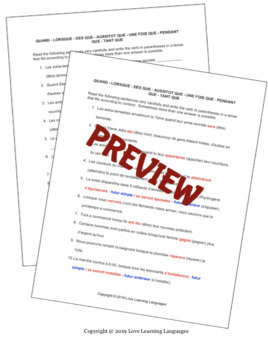 This is an upper-intermediate comprehensive French grammar lesson on how to use seven different conjunctions and conjunctive phrases in the correct tense. 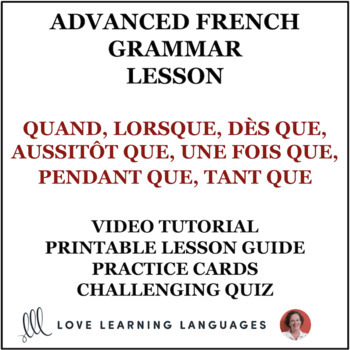 This lesson focuses on quand, lorsque, dès que, aussitôt que, pendant que, tant que, and une fois que. The following verb tenses are used: le présent, le passé composé, le futur simple, l'imparfait, et le futur antérieur. 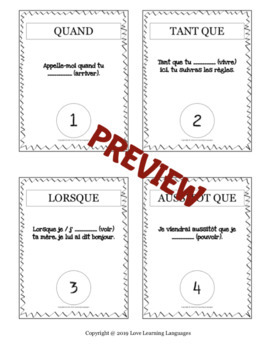 This resource is part of my Ça y est, je parle français! French 3 and 4 curriculum. Quiz / test / worksheet with 36 fill in the blank sentences. Students must choose an appropriate tense for the verb in parentheses given the context of the sentence. Answer key provided. Step 1: Teach the grammar lesson (or show my video lesson) about these conjunctions and conjunctive phrases. Even if your students have never even heard of some of them, by the end of this lesson they'll have a much better understanding. Before teaching the lesson, be sure to download, print, and distribute lesson guides where you'll find all of the rules and examples you'll need. I've even added a few helpful hints! If you find that some students struggle with this concept, you may want to assign the video lesson for homework (like a tutoring lesson). Step 2: Have students work individually, in small groups, or as a whole class using your set of practice cards. An answer key is included so that students can easily check their own work. I'm including paper free versions that you can project or have kids open up on their devices as well as a version with 4 cards per page that you can print and cut out in case you want them off of their screens! 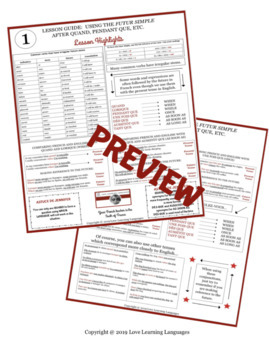 You'll be able to use this resource year after year to have your students truly practice and master their new French grammar skill. Step 3: Use the 36 sentence worksheet as a quiz, test, in class worksheet or take home assignment. This quiz is meant to be quite challenging! Students may need to look up some words, but the most important thing will be to see if they've understood the concept of when to use which tense following these conjunctions and conjunctive phrases. Check out my new Build Your Own French Bundle option. Select resources from my store, and if they total $20 or more, I'll quickly create a special order bundle for you at 20% off. No sale items or other already discounted bundles can be included. ⚜Sign up for my newsletter receive free gifts weekly!